To varying degrees, many of these interconnected societal and environmental problems are linked to the industry’s incumbent products or business practices – childhood obesity and the fast food industry, fresh water consumption and the beverage industry, personal privacy and the high tech industry, child labor and the garment industry. In no case is industry the sole source of these challenges, though their roles and their responsibilities make them a clear focal point in the discourse. For the power industry, the main external problem that we “own” is climate change: right now the mother of all social issues. And our "leading" contribution to the problem – the greenhouse gases (GHGs) we emit in the course of electricity production – is both irrefutable and quantifiable. As the largest emitting industry domestically of CO2, our responsibility to lead is clear. But it seems equally clear that industries and businesses which consume all of our fossil fuel energy - and the regulators and policymakers who focus on these sectors - should also step up to do their part. Solving global warming is a moral imperative, the failure of which will have untold economic, social and environmental consequences. Some energy consumers are stepping up, big time. Others however, are not. Over the past year, in the high tech industry alone, Apple and Google have been properly lauded for their clean energy efforts, particularly around their new clean energy-powered data centers (date centers are 1.5% of global electricity demand and growing). On the same topic, but at the other end of the spectrum, a Greenpeace report earlier this year called out Amazon, Twitter, Netflix and Pinterest via an airborne blimp billboard over Silicon Valley for their lack of clean energy efforts. So if having the audacity to rely on grid power now puts a company at risk for public shaming, then the day is coming when every company’s energy usage will be viewed through a moral filter – similar to how its labor practices and foreign investments are viewed today. Fortunately, some energy companies now recognise the electric power industry’s contributions to climate change and are responding. We have stepped up and have established a clear course toward our own clean energy future by setting ambitious sustainability goals as part of our continued corporate growth strategy. The core of these goals is to reduce our CO2 emissions by 50% by 2030, and 90% by 2050, while continuing to grow our business. These are the most aggressive carbon reduction goals ever set by a major power company. In effect, we are transforming from a traditional fossil-based electricity generator into a multi-faceted 21st century sustainable energy company. This transformation will affect everything we do as a company, from the projects we invest in, to the types of customers we serve. We have already begun to lay the groundwork. And we’re not alone. This year, we announced that we are building a renewables-driven microgrid for Necker Island which will dramatically reduce diesel fuel consumption by at least 75% compared to its current usage. We’ve announced unconventional strategic partnerships with like-minded companies that are the vanguard of their industries: we have partnered with Unilever to help the company achieve 100% renewable energy use from actual onsite and offsite generation at every U.S. site by 2020. We recently completed a solar installation at The Phoenician – the first of several solar projects under a strategic partnership with Starwood Hotels - which will be followed by future projects at properties in Hawaii and the U.S. Virgin Islands. And at Arizona State University, we installed over 15MW of solar over parking garages, parking lots and on the basketball arena. In each case, whether Unilever, Starwood, Apple, Google, ASU or Virgin, the decision to be a leader in clean energy was made at the CEO/president level, both as an economic proposition but also as a statement of what the institution and its leadership stood for. The decision of each of these CEO’s was heartily embraced by the institution's employees and other stakeholders; people want to work for, and do business, with companies and other institutions that stand for something… and avoiding melting the planet is a good thing to stand for! CEOs recognising that they can make the right societal decision and couple it with a business opportunity is a new approach to sustainability. The private sector can take the lead on climate change. Consumers, especially younger ones, are telling us that they want to do business with companies that have their best interests at heart, and we’re listening. Companies that align themselves with the embedded sustainability values of their millennial customers will connect with them and help drive the societal change that is necessary for a clean energy future, while still benefitting shareholders. In fact, companies that appear to fall behind in their sustainability efforts are now at risk of getting left behind in the new energy economy. Make no mistake, there are economic reasons for sustainability, but action is ultimately necessary – and ever-increasingly urgent if we want to avoid the very worst effects of climate change. We are already seeing negative effects and they are only going to get worse. We owe it to our children and generations unborn to do everything we can to leave them a world that is safe, healthy and life-sustaining. 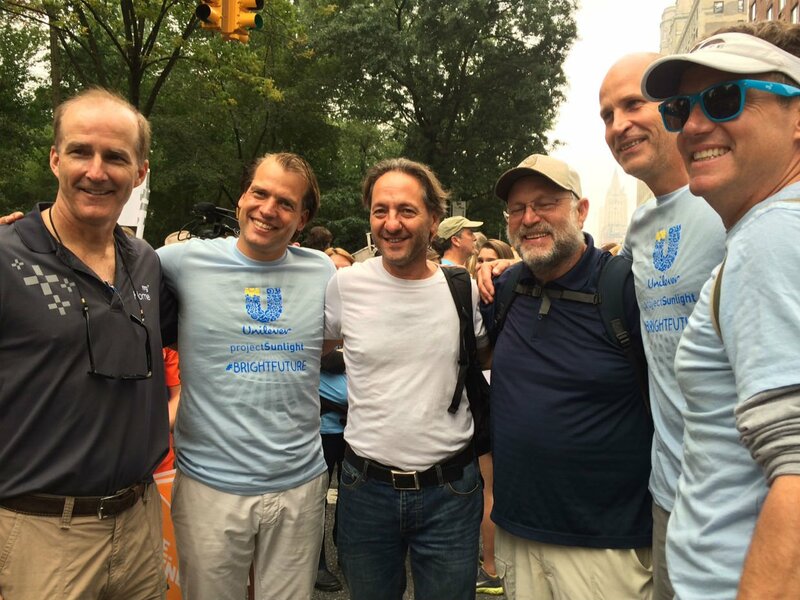 At the People’s Climate March, from left to right: David Crane, CEO of NRG; Kees Kruythoff, President of Unilever NA; Jo Confino, Executive Editor at the Guardian UK; Jerry Greenfield, co-founder Ben & Jerry’s; Henry Schrimer, Chief Financial Officer for Unilever NA; and Jonathan Atwood, Vice President of Sustainable Living and Corporate Communications for Unilever. 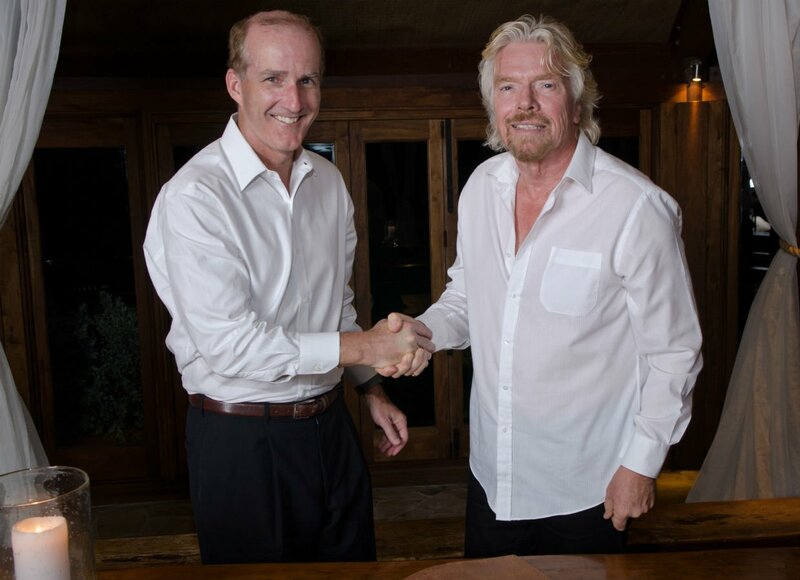 - This is a guest blog by David Crane, CEO of NRG and may not represent the views of Virgin.com. Please see virgin.com/terms for more details.